It seems like a lifetime ago. And, in many ways, it was. In 2001, I worked for TV GUIDE in its listings department – we wrote the descriptions that the whole world (or, at least, some in the U.S.) read. We also wrote in-depth Close-Ups (or, at least, as in-depth as 500-600 characters could be) for the magazine; and longer essays for the TV GUIDE Web site. For whatever reason, likely my love of music, I was the designated backup writer for the Music Guide, which was featured in the black-and-white section every week. The late Fred Mitchell – as good a guy and colleague that I’ve worked with – was the primary. Anyway, in those days, editors held much sway at TV GUIDE; and different editors had different philosophies. Some changed every word. Others made minor corrections. I cannot remember who handled this particular essay and, in many respects, it doesn’t matter – this was my final draft. So, regardless of who edited it, or how it was edited, this is how I intended it to be. That said, I do remember the editor sending a note justifying my use of the “f” word to a higher-up; it may well have been the first, and likely last, time the “f” word was used in any TV GUIDE product. And therein lies one of the most charming aspects of the film: Linda’s remembrances. “The idea was that they’d both be interviewed,” recalls Donald. Her untimely passing, however, led him to search for an alternative method to add her voice to the proceedings. “We read an article written in Melody Maker that was written in 1973 while they were on tour with Wings. It was just an article done on Linda. We got in touch with the journalist and [asked], ‘Listen—you didn’t record that interview, did you?’ He kind of went up into his attic and got this old tape.” That and the other archival interviews add an insight to the film that is as touching as it is bittersweet. For instance, following the dissolution of the Beatles, Paul and Linda retreated to a remote, dilapidated farm in the Scottish countryside. “It was a three-room house with rats in the walls. It was derelict, it was at the end of nowhere. It had no hot water, anything. But, it was some of the best years of my life,” reflects Linda. As she speaks, a home movie fills the screen; McCartney’s “Heart of the Country,” from his Ram album, filters in—and you’re suddenly thrust into their lives, seeing it through their eyes. For a moment, he’s no longer “Beatle Paul” and she’s no longer the “American divorcee” who helped breakup the Beatles. They’re simply a husband and wife, very much in love, who dote on their kids—like so many other young married couples. 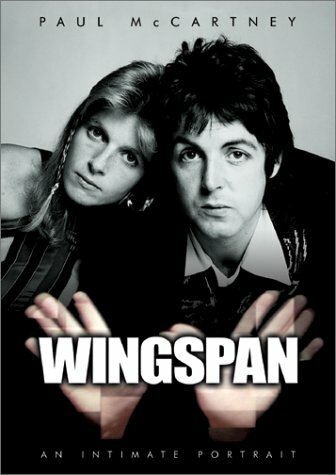 Of course, one of the major criticisms of Wings centered on Linda’s involvement in the band—a topic broached here. “It was a very gutsy thing for her to do,” reflects Paul of her decision to play keyboards. And, as she intimates, the barbs did hurt. “It’s like sticks and stones will break my bones, but words will break my heart. So, who listens?” For the record, it should be noted that Linda did in fact contribute to Wings’ success—the infectious reggae break in Wings’ smash single “Live and Let Die”? She wrote it. Another frequent criticism directed at Wings centered on the music. While Wingspan doesn’t address that issue head-on, give a listen to the songs that accompany the visuals. Many are, indeed, certifiable hits—“Maybe I’m Amazed,” “Live and Let Die,” “Jet,” “Band on the Run,” etc. As often as not, however, the soundtrack features such off-beat treats as the rollicking b-sides “Oh Woman, Oh Why” and “The Mess”; and overlooked gems “Back Seat of My Car” (from Ram), “1985” (from Band on the Run) and “Call Me Back Again” (from Venus & Mars). They more than back up the statement that daughter Stella McCartney made, via her shirt, when she accompanied her father to his (overdue) induction into the Rock ‘n’ Roll Hall of Fame in 1999: “About f-ing time.” In other words: give the man, and his music, his due. Well, I suspect the censored version of the f— word has appeared from time to time since. (And, fwiw, people in Other Departments, such as myself, also wrote short essays and such for the TVG website.) I never did hear of what happened to Fred. Nice to see this here. Fred passed away in 2012. Totally unexpected from what I gathered at the time. A good guy, great taste in music.